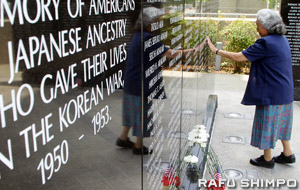 Ken Hayashi, chairman, announced that on Saturday, May 25, at 11 a.m., the annual Memorial Day service for all Japanese Americans who gave their lives in the nation’s wars will be held adjacent to the Japanese American National War Memorial Court (Memorial Court) at the Japanese American Cultural and Community Center (JACCC), located at 244 S. San Pedro St. in Little Tokyo. This year’s event will be jointly sponsored by the Japanese American Korean War Veterans (JAKWV) and the Japanese American Vietnam Veterans Memorial Committee (JAVVMC). “Our community and nation are forever indebted to these Japanese Americans from all wars, whose names are engraved on the four monuments in the Memorial Court for their supreme sacrifices for the United States of America,” organizers said. The keynote speaker will be Robert Fumio Leong, former chairman of the California Veterans Board, who served as a captain with the 5th Special Forces Group and Military Assistance Command, Vietnam, Studies and Observations Group (MACVSOG) from 1968 to 1970. Helen Ota, artistic director of Cold Tofu and public information officer for the Japanese American National Museum, will act as mistress of ceremonies. Participating in the service will be representatives from many veteran and community organizations throughout the Southern California area. Koyasan Buddhist Temple’s Boy Scout Troop 379 and the Redondo Union High School’s Marine Corps Jr. ROTC will again take part in the ceremony. Representatives from the Buddhist and Christian faiths will offer prayers to these brave men. The general public is also invited. For more information, contact Hayashi or Miyoshi (see above) or Sam Shimoguchi at (310) 822-6688.